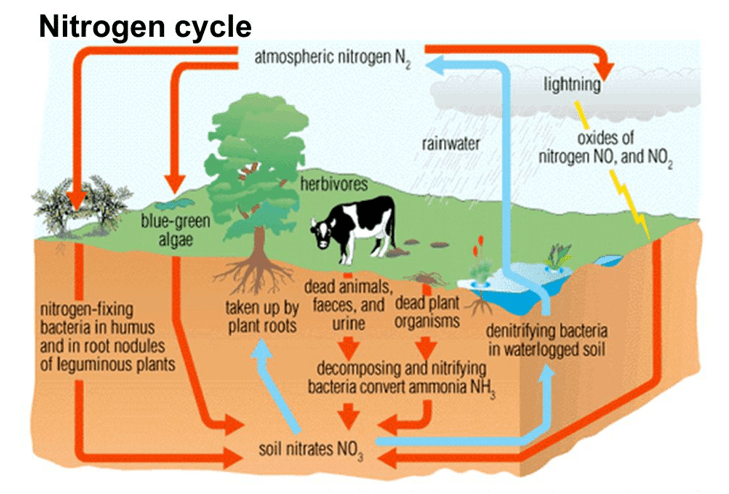 The Nitrogen Cycle: A sequence of processes by which nitrogen moves from the atmosphere through living and dead organisms, into the soil and back to the atmosphere. Decomposer bacteria – decomposes proteins and urea and turns them into ammonia. Nitrifying bacteria – converts ammonia to nitrites then nitrates. Nitrogen-fixing bacteria – turns atmospheric nitrogen into nitrogen compounds. Denitrifying bacteria – turns nitrogen compounds back into nitrogen gas. No help to living organisms. Nitrogen gas takes up 78% of the air and is very unreactive. As a result, it cannot be used by organisms directly. Nitrogen is necessary for making proteins for growth, so it is essential they get it. Nitrogen in the air is turned into nitrogen compounds by nitrogen-fixing bacteria which is called nitrogen fixation. Nitrogen fixation also occurs with lightning as there is so much energy in a bolt of lightning that it’s enough to make nitrogen react with oxygen to give nitrates. Nitrogen compounds, such as nitrates, can be absorbed by plants through the soil and use them to make amino acids (then to proteins). As animals can only get nitrogen compounds from eating plants, nitrogen compounds are passed along the food chain. Decomposer bacteria turn the proteins and urea in dead plants and animals and waste into ammonia. This ammonia can be converted into nitrites and then nitrates by nitrifying bacteria. As nitrates can be absorbed by plants, the nitrogen in these organisms is recycled. Some nitrogen-fixing bacteria live in the soil. Others live in nodules on the roots of legume plants. This is why legume plants are so good at putting nitrogen back into the soil, and for this reason they are often planted in a field before the main crop is planted in the same field so the main crop has a lot of nitrogen. If soils are lacking in oxygen, such as when they are waterlogged, then some denitrifying bacteria will convert the nitrates back into nitrites and others convert nitrites back to nitrogen gas. Fertilisers are used a lot in modern farming as they help crops grow very well; meaning higher food yields so more people can be fed. Fertilisers include nitrates, and they replace the nitrates taken out of the soil when the crops grown. Eutrophication usually occurs when too much fertiliser has been added to the soil and especially if it rains afterwards. Water can wash the nitrates away as nitrates are very soluble, and they can end up in water systems. Increase nitrogen in water system. Algal bloom –quick growth of algae. Algal blooms cover the surface of the water which blocks out sunlight. Plants die out as they compete for the light and cannot photosynthesise. Increase dead matter causes an increase in bacteria and microbes. These respire aerobically which uses up the oxygen and thus reduces the oxygen concentration in the water. Other organisms cannot respire due to the oxygen reduction and therefore they die as well.